Comefri provide selection programs and calculation engines to choose the best fan for your requirements. Aeolus4 is the Comefri selection software. 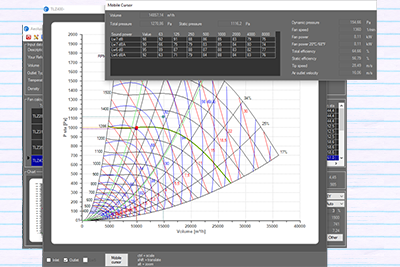 It allows the customer to obtain a large quantity of catalogue information, including fan curves, quotes, function fan ranges and application conditions. Furthermore Aeolus4 is a user friendly program that makes the calculation, selection, configuration of the correct fan easy. The program also includes the ability to select the correct transmission (vee-belts & pulleys). The BlackBox 32 bit is the Comefri fan calculation engine. Aeolus4 is the Comefri graphical interface for the BlackBox. The BlackBox is a library of functions written for programmers who want to make applications to calculate air handling units using COMEFRI range of fans. More details in Software page. Comefri has adopted the EDIFACT standard for the exchange of information with customers. This procedure allows to save time in the management of orders and the receipt of goods and it reduces the delivery times. Comefri applies a personalized label on its products for the customer, containing the customer item and the customer’s order reference, but also a standard or 2D barcode. This system allow customers to make the acceptance of the Comefri products in its own warehouse automatically.